Squaw Creek NWR, Mound City, Missouri: From a trail atop the loess bluffs at Squaw Creek National Wildlife Refuge, one can see clear to tomorrow, or at least into Nebraska and Kansas as well as Missouri. Meanwhile, down on a pond, a common gallinule (also called "moorhen") traverses a log foraging for insects and aquatic plants. 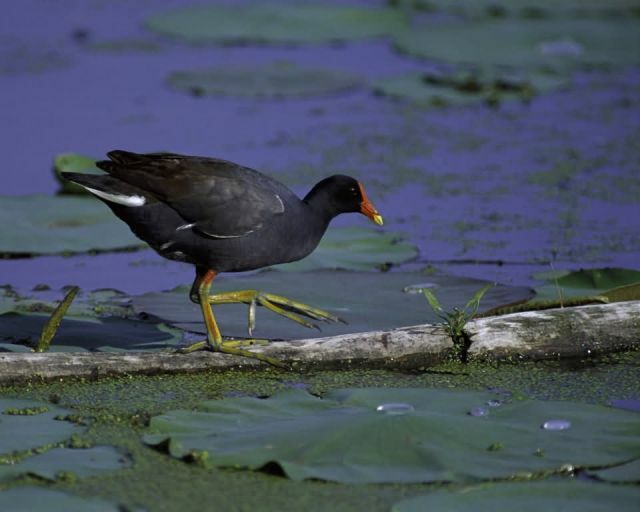 Its long un-webbed toes enable it to walk lightly on the giant lily pads found in the ponds and marshes. The National Audubon Society has named Squaw Creek refuge, with its abundant wildlife, including several hundred bald eagles and hundreds of thousands of waterfowl in winter, one of its "best bets" for nature photography on a refuge.